The Food Opera located in the basement of ION Orchard is home to many famous local delicacies, but a new entrant has recently joined the food heaven. 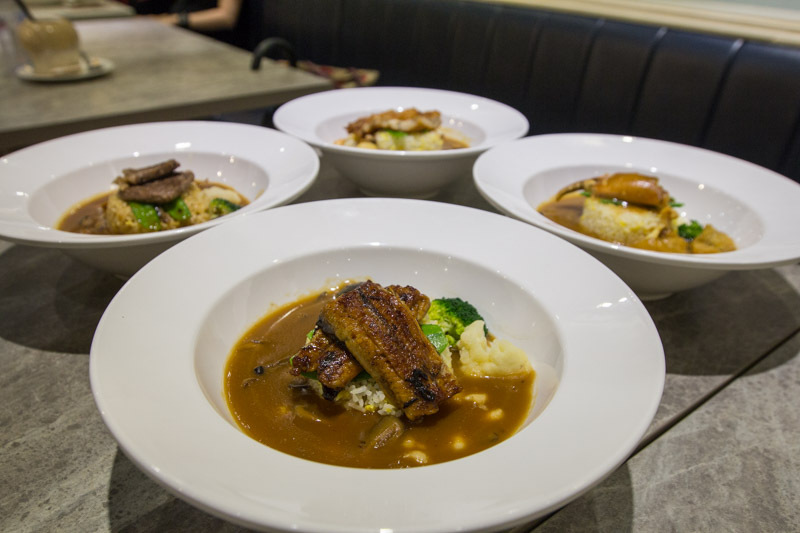 SG Braised Rice is a new concept from Thai Village Restaurant, which has 25 years of history whipping up mouthwatering dishes with premium ingredients, and now serves quality food at pocket-friendly prices in a food court setting. 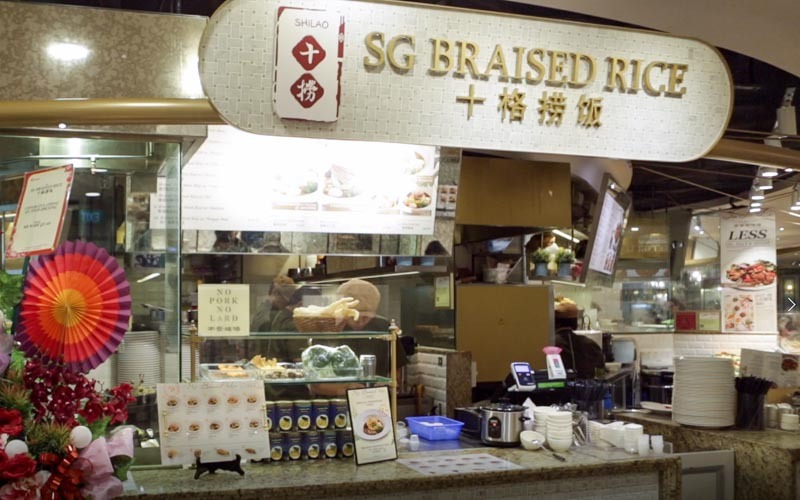 The ‘SG’ in its stall name doesn’t only stand for Singapore, it’s actually the first two initials of its name in Chinese, Shi Ge Lao Fan, or Shi Lao for short. 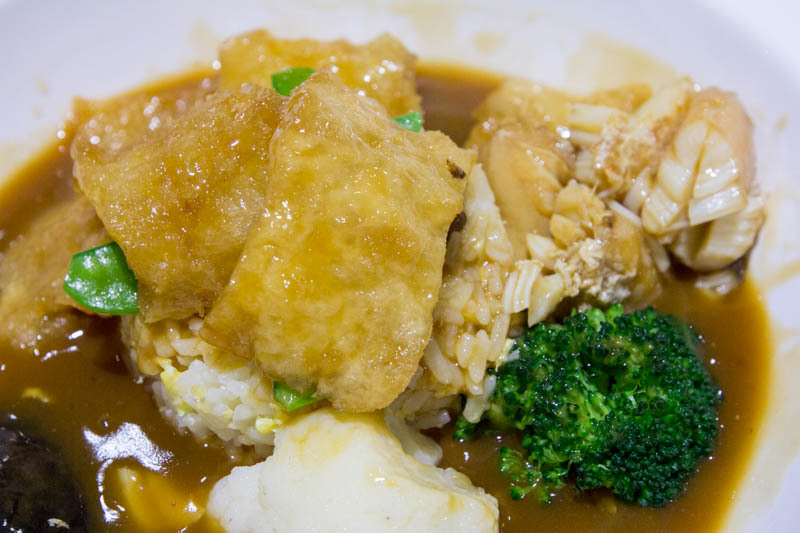 Shi Lao serves rice bowls that come with wok-fried rice with eggs, a thick superior sauce used for braising, spicy tangy green chilli sauce and a medley of vegetables such as broccoli, cauliflower, snow peas along with a topping of your choice. 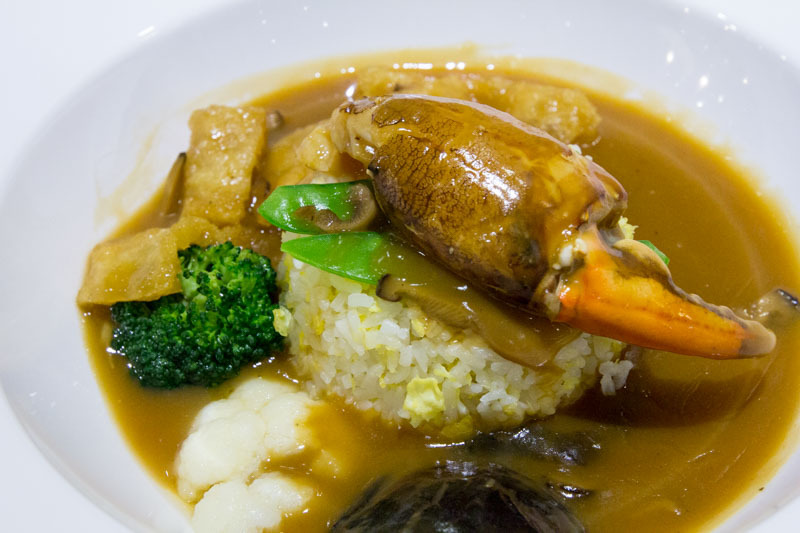 Being a seafood lover, I started off with the Braised Fish Maw Rice w/ Crab Claw ($9.80). This bowl came with a big crab claw that was shelled and pieces of fish maw in addition to the fried rice and vegetables. The tender crab meat and its sweetness balanced very well with the umami flavour from the fish maw that was coming through in the sauce. 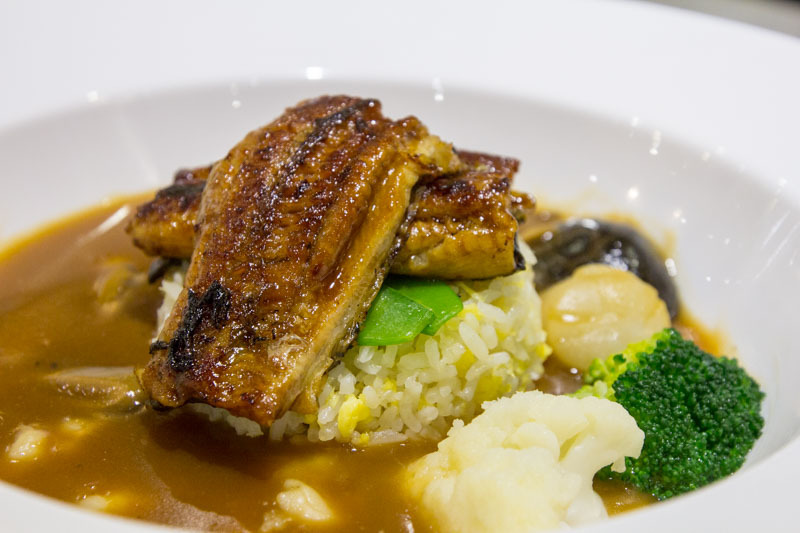 For something a little more special, go for the Braised Seafood Rice w/ Eel ($11.80), which was a delight to have. The rice had an eggy taste and strong wok hei, pairing well with the thick sauce that had an earthiness from the mushrooms used to cook it. There was a mix of textures with the crunchy snow peas, prawn bits, and the soft eel meat, my only quibble is that the sauce for the eel was a tad too sweet. Moving on to a more premium dish, the Braised Seafood Rice w/ Wagyu Beef ($18.80). This bowl came with Australian Grade 6 Wagyu Beef and scallops. 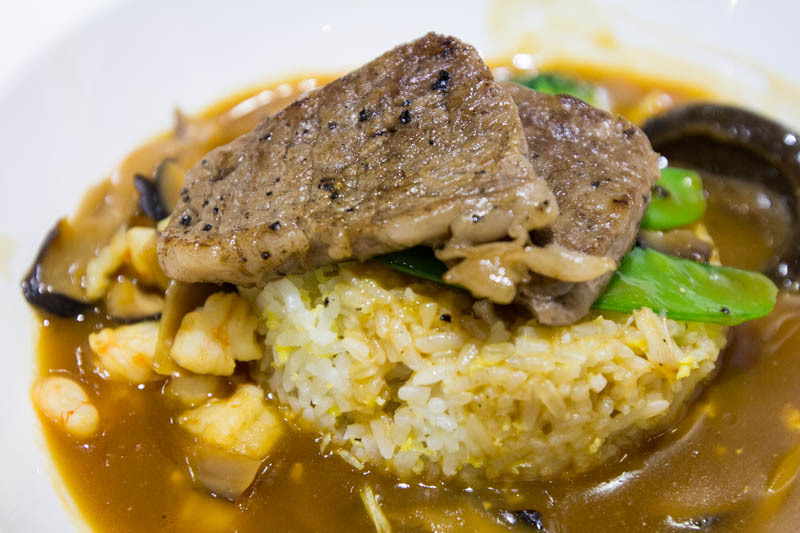 The beef was tender and well-seasoned and accompanied with a stronger mushroom flavour in the sauce as compared to the earlier bowls, along with scallops that were of a very decent size. 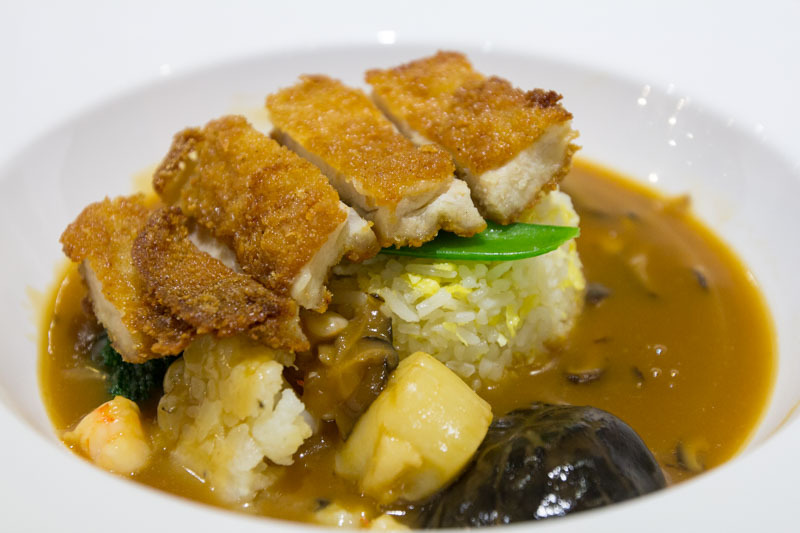 The Braised Seafood Rice w/ Chicken Cutlet ($7.80) is a classic dish that came with a generous portion of fried chicken that was crispy, yet still retaining moisture. I felt that the sauce went well with this dish that paired nicely with the slight sweetness from the chicken. Having used to the texture of fish maw in other restaurants, the Braised Seafood Rice w/ Fish Maw ($6.80) bowl surprised me. The fish maw pieces were deep fried before being braised to give a crunchier texture as compared to the slimier texture when cooked in soups. 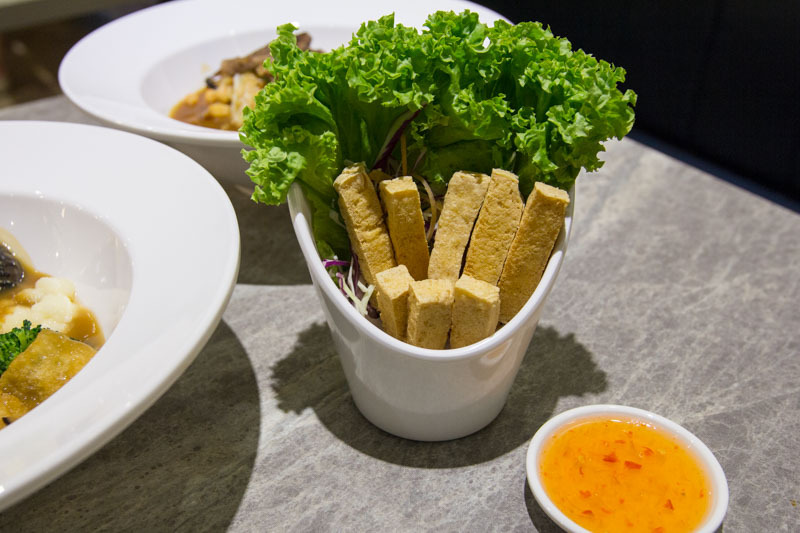 The sauce in this bowl is also much sweeter than the others thanks to the addition of crab meat, with a lighter mushroom taste to let the fish maw take the limelight. I also tried something I’ve never heard of before, the Beancurd Fries ($3.20). The beancurd was firm but smooth and went very well with the sweet chilli. I reckon this crispy delight would go perfectly with a glass of ice cold Thai beer. All the dishes I tried were great, but I’ll definitely recommend the Braised Fish Maw Rice w/ Crab Claw and Braised Seafood Rice w/ Eel bowls. After all, there’s nothing like tucking into a bowl of fragrant rice drenched in umami sauce and paired with a generous serving of protein.